This is why I love setting a one-word guide this isn’t tied to failures. This one word can be used to set weekly, monthly and even yearly goals. It can help you decide whether an opportunity is right for you. Think of it as the quickest business plan you will ever write! Make a list of five things you did in 2018 that you are proud of (queried an agent, made a new writing friend, joined a critique group etc.). Now write down one thing you want to accomplish in 2019 that’s within your control. Write down one thing you need to accomplish. List what is standing in your way of accomplishing your want and your need. Now that you have zeroed in on your want and need, what sort of action can you take to make this happen? That action is your word. For example, (1) I’m thrilled I had the courage to submit the first page of my YA novel to a live-action slush panel for critique. (2a) I want to get published in the kidlit world; (2b) I need to honor my voice. I can’t control the publishing process but I can do the work of continuing to improve my craft and submitting my work. (3) Not believing in myself stands in my way. I picked MAKE, as in make magic happen (inspired by the book Big Magic, in which Elizabeth Gilbert talks about finding the magic in creating and not worrying about the critics) but also make things happen (send out queries, get critiques on my work etc.). To build on my above-mentioned success I will make my YA stronger. Now your turn! Once you have your word, print it out and put it somewhere visible. Remember your word is what suits you today, so it’s okay to pick a new word down the road if it no longer serves you. Happy New Year! 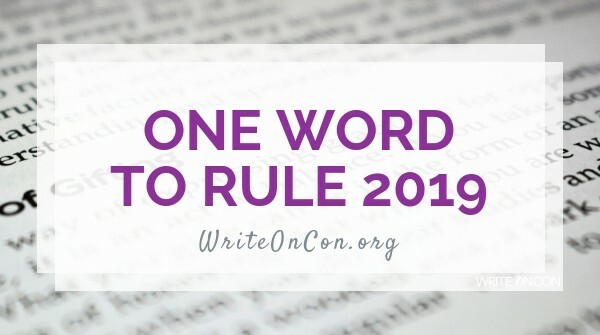 If this post inspired you, please share your word below. I will be back in a few weeks with one final post on filling your writing bucket. This really helped me hone into what I need to do to accomplish my wants and needs. The one word concept is perfect for me! Thanks! DAILY- That’s my one word. I like it! I’m assuming that has to do with making writing a daily thing?